Indian national highways are the part of Indian road network. It provides a valuable support to the transportation system of India. NHAI (National Highways Authority of India) is responsible for the maintenance, building and upgradation of National Highways (NH). It operates under the “Ministry of Road transport and Highways” of Government of India. 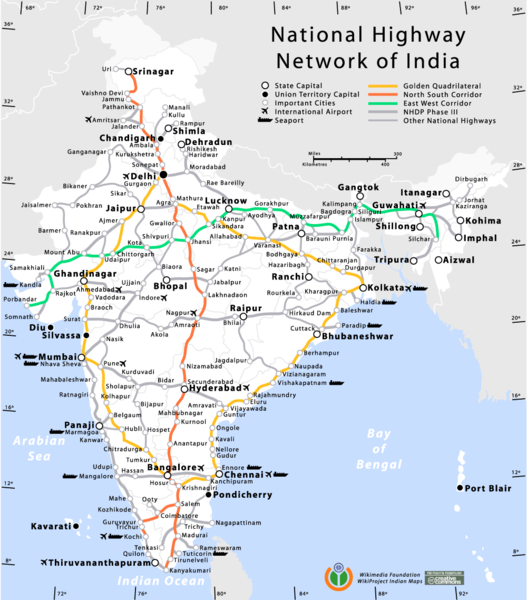 India has the second largest road network in the world. NH7 is the longest NH (2369 KM) from Varanasi to Kanyakumari and NH47A is the smallest National Highway (6 KM) from Ernakulam to Kochi Port. NH only comprises 2% of all the roads in India. But it carries 40% of total traffic. The total length of all the national highways is about 71,243 KM (till 2014). Out of these only 15,000 KM roads are 4 or 6 laned and rest are 2 laned. In 1998, under the leadership of Atal Bihari Vajpayee, NHDP (National Highway Development Project) was launched. The focus of this project was to upgrade and rehabilitate the national highways. This project included the development of Golden Quadrilateral, NS-EW corridor. It is the largest highway project of India. This highway connects India’s four most important metro cities (Delhi, Mumbai, Chennai, Kolkata) in four directions of India and many intermediate cities like Ahmedabad, Bengaluru, Kanpur, Bhubaneswar. This highway is the world’s fifth longest highway. It was started in 2001 and completed in 2012. It is one of the largest highway project of India. In this project two corridors are going to be build – North South Corridor and East West Corridor. North-South corridor will connect Srinagar in north and Kanyakumari in South. East-West Corridor will connect Silchar in east and Porbandar in west.